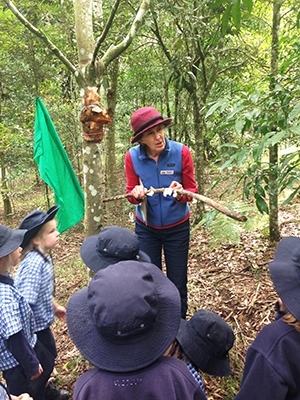 A team of volunteer guides are available throughout school terms to guide preschool and primary school groups through various parts of the Lismore Rainforest Botanic Gardens. using picture cards to identify birds, and animals common or threatened. Families are welcome to visit weekends, as well as school holidays. Entry is free, although donations are appreciated. Picnic tables, BBQs and toilets are available. School holiday walks and activity mornings are advertised prior to each holiday period. Leaflets on self-guided walks are also available in boxes on-site near the large display maps, at each car park and beside the Lismore City Environment Education Centre. Eucalypt forest with resident koalas – a sunny grassed area good for picnics. Hoop pine forest – cool and refreshing, especially in summer. Enjoy the quiet majesty of the tall straight pines towering above. Useful plants gardens – open and sunny, this garden is a warm place to wander in winter especially to enjoy the wattles in flower. Large photo signs help identify the many uses of plants, especially the traditional uses by local Aboriginal people. Rainforest area with Discovery Trail – a good area to see the structure of a forest with vines growing high up into the canopy, special plants with large leaves and bright berries in the understorey, and fungi, moss and ferns on the forest floor. Birds are always around and wallabies are seen regularly. There is a lot to see, do and enjoy in the Botanic Gardens. For more information email friendslrbg@bigpond.com.